Overall print size (LE & AP): 22" x 28"
Image size (LE & AP): 14 1/4" x 22 1/2"
Due to package size, canvas orders outside of the US will incur actual shipping charges. 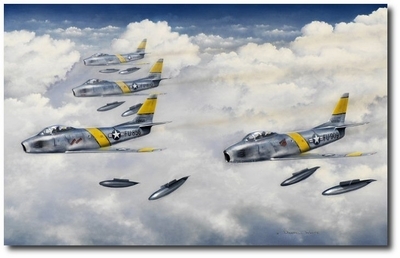 September 16, 1952, Capt. 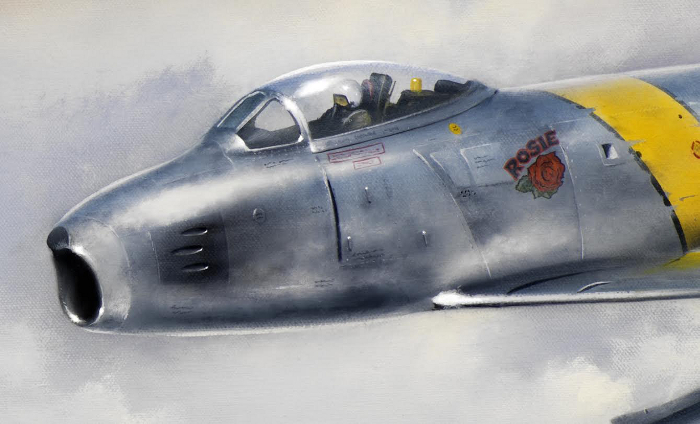 Karl K. Dittmer in F86E Sabre 52-2856 "Betty Boots" and Capt. 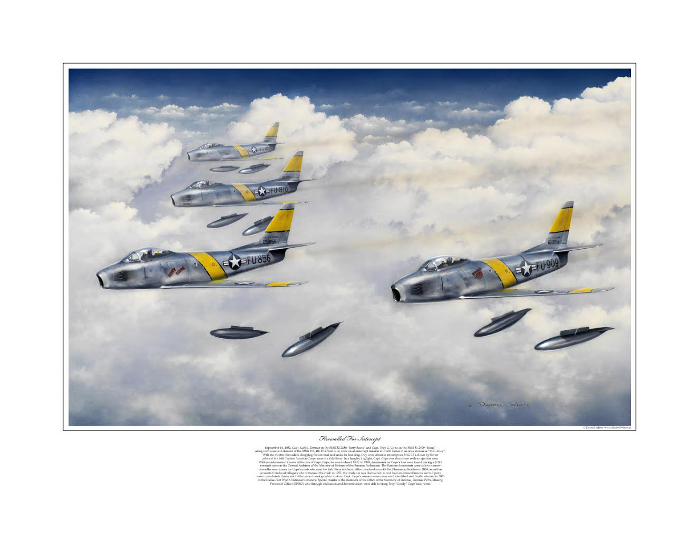 Troy G. Cope, in F-86E Sabre 51-2909 "Rosie" along with a second element, all of the 335th FIS, 4th FIG from K14 were on an intercept mission in North Korea in "MiG Alley"�. 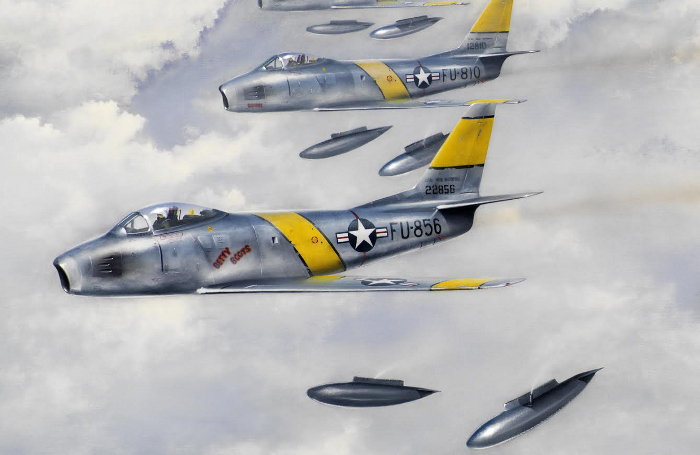 With throttles firewalled, dropping their external fuel tanks to reduce drag, they were about to intercept six MiG-15s, flown by Soviet pilots of the 64th Fighter Aviation Corps near the Yalu River. In a lengthy dogfight, Capt. Cope was shot down and nobody saw him eject. Having no information on the fate of Capt. Cope, he was declared MIA. In 1999, documents on Cope's loss were found during a JCSD research cycle in the Central Archives of the Ministry of Defense of the Russian Federation. The Russian documents were able to narrow down the search area of Cope's crash site near the Yalu River in China. After coordinating with the Chinese authorities in 2004, as well as receiving accounts from local villagers who witnessed the crash in 1952, the crash site was discovered. A boot heel and miscellaneous aircraft parts were quickly discovered. After an archaeological excavation, Capt. Cope's remains were recovered, identified and finally interred in 2005 in the Dallas-Fort Worth National Cemetery. Special thanks go to the members of the Office of the Secretary of Defense, Defense POW/Missing Personnel Office (DPMO) who through their dedication and determination, were able to bring Troy "Gordy"� Cope back home.